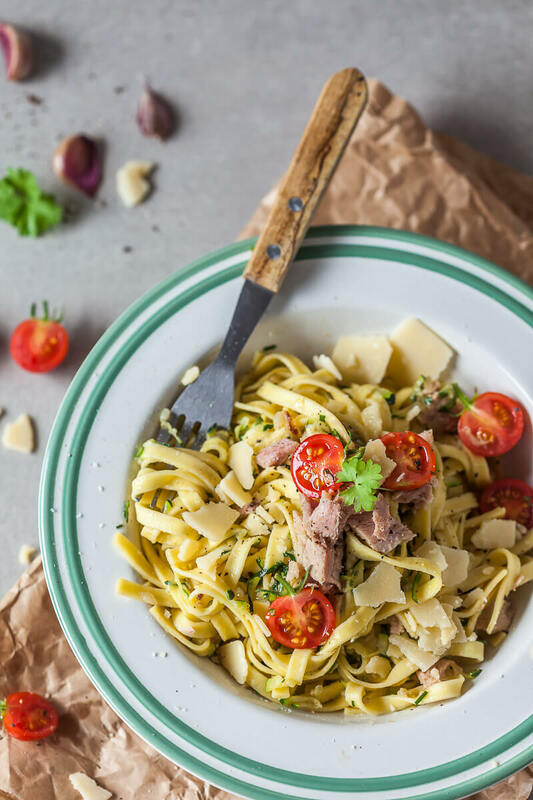 Delicious Zucchini Tuna Egg Noodles that are ready in just 15 minutes! This recipe is dairy-free and a perfect lunch or dinner. Bring a pot of salted water to a boil and add egg noodles. Cook according to package instructions, about 10 minutes until al dente. When cooked, save a cup of pasta water, then drain the noodles and set aside. Peel and finely mince onion and garlic. Coarsely grate zucchini. Heat a skillet with a tablespoon of oil, then add onion and garlic and fry while stirring until translucent. Add grated zucchini and continue cooking, until the zucchini soften and reduce, about 10 minutes. Lastly, add cooked noodles to the skillet, a cup of saved pasta water and the tuna. Stir well to combine thoroughly. Season with salt and pepper, top with some halved cherry tomatoes and parmesan, and serve.